The test beam readout of the Rome/Pavia MDT chambers use the Fibre Channel based S-LINK. The H8 test beam has run in October 1997 (see photo) and August 1998. The TDC boards to be mounted on the MDTs were built in 1997 and have been tested as was the interface between the TDC bus and S-LINK. In the first run in 1997 the S-LINK data has been read-out directly by a RIO 2. The RIO 2 memory in turn was read out by the RD-13 DAQ system. Later on, in the same testbeam, the S-LINK data was sent to the Level 2 trigger boards (a VMETRO PMC/VME adapter with processor) to be processed together with the Level 1 data. Those tests were made with a Fibre Channel based S-LINK which is borrowed from the S-LINK team. The board sends data encapsulated between control words with the first dataword being the Format Version Number, all according to the ATLAS Read-out Link Data Format document. 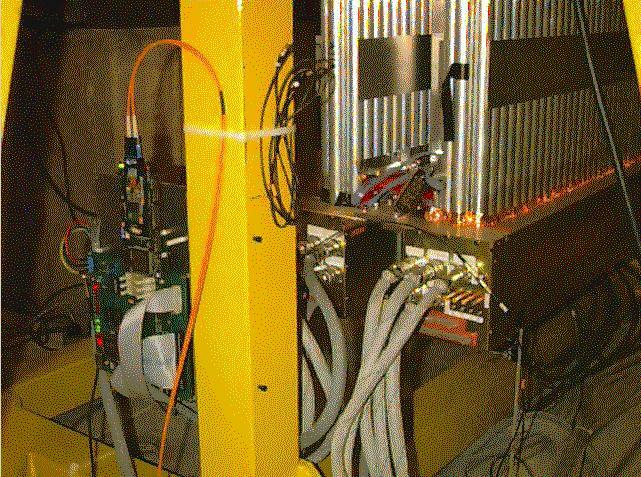 7 October 1997: H8 test beam takes data over Fibre Channel S-LINK cards and S-LINK to PMC interface. 13 August 1998: 1998 test beam has similar DAQ system.